The Feb/March 2005 issue of OTL had an article on clutch splines where I suggested some reasons for the clutch spline failures on some 6-speed boxers. Misalignment between the engine and transmission was a possible cause, and I illustrated a few ways in which misalignment might be present. In the last two years I've inspected some bikes which experienced such failure, trying to find a common cause. What I'm presenting here is my opinion based on my observations. 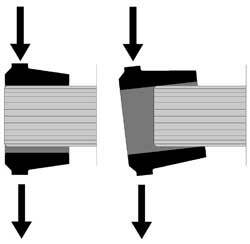 A lateral misalignment would probably result from mismachining of the engine case or the transmission housing. Here, the input shaft is too high (or the crankshaft is too low). One side of the hub would be pressing against the shaft and the other side wouldn't. The load would be distributed across the entire side of the hub, and as the parts rotated all of the surfaces would bear the load at some point. A certain degree of this misalignment is normal, due to manufacturing tolerances. This was suspected in a series of failures (on the same bike) in a case on bmwsporttouring.com. As a result, I started measuring every bike I could for this misalignment. I still do, but so far I have yet to find one where this alignment is suspect. One problem with this measurement (where the axis of the crankshaft is compared to the center of the bore for the input shaft in the transmission) is that the crankshaft floats in the crankcase bearings with up to 0.1mm clearance. 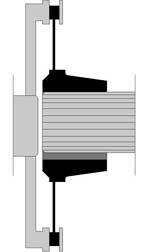 When the engine is not turning quickly, the crankshaft isn't centered in the bore because there are other forces (gravity, alternator belt tension, etc.) on it. I always find the crankshaft to be lower than it should be, but it can be lifted so that it is higher than it should be. It's a very difficult measurement. A bent housing (also referred to as the clutch carrier) will cause the hub of the friction disk to try to rock on the input shaft. The load will change to a different location every time the clutch is engaged. When the clutch housing replaced the flywheel in 1981, there were problems like this. BMW doesn't publish specifications for the required alignment of the housing. Before 1981, though, flywheel runout specifications were published and the limit was 0.10mm. Most modern housings I have measured have about that much runout at the three clutch mounting tabs. In one particular case, a bike was trailered to me after its second spline failure. I measured everything I could, and found no lateral misalignment. Clutch housing runout, though, was noticeable. Of the three mounting ears for the clutch; if the first was considered to be the standard then the second was 0.12mm off and the third was 0.20mm off. Inspection of the clutch surfaces showed that the clutch disk was overheating one area of the pressure plate and cover, which is consistent with misaligment within the clutch. As an experiment I machined all three tabs flush with each other and reassembled. There was a lot of clutch chatter on engagement, and I concluded that the machining was ill-advised since the spring (which seats on a different area of the carrier) was probably now misaligned relative to the other parts which were now straight. It wasn't acceptable, but the most interesting comment came from the owner when I gave a status report. "It's always been like that." A new clutch carrier made the bike better than it had ever been the whole time he owned it. However, that was one case. Another twice-failed bike I've inspected doesn't have such misalignment. While I firmly believe there's a specific cause for each failure, I have no reason to think that it's the same every time or that it's present on all bikes. Why on the newer bikes? This still leaves the question of why it seems more common on the R1150-type models than on older ones. Older bikes would occasionally show some wear on the splines, requiring replacement of the input shaft as a prudent step, but it's very seldom that the owner is left on the side of the road. 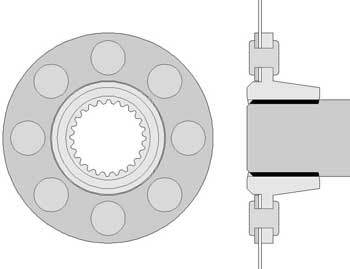 These diagrams show the differences in the two clutch spline designs. On the left is what I'll call the 5-speed spline, used on the R1100RT, RT, GS, and R. On the right is the 6-speed spline, used on the R1100S, all R1150 models, and R1200C. Although the spline pattern is different (fewer and thicker splines on the 6-speed) the most obvious difference is that the input shaft doesn't protrude through the clutch hub. Specifically, the 5-sp shaft protrudes past the plane of the friction disk whereas the 6-sp shaft does not. The difference is about 4mm and the hub on the 6-sp is lengthened by 4mm to keep the same total engagement length. However, on the 6-speed the engagement is all on one side of the friction disk. Compare the effects of a lateral load on the friction disk hub with each design. As with the misalignment illustrations, the geometry is greatly exaggerated, but you can see that if the shaft protrudes beyond where the arrows are, the hub is relatively stable on the shaft, wheras the hub will try to rock if the shaft ends before it reaches the arrows. The arrows are where any lateral forces (from misalignment of nearly any kind) will act on the hub of the clutch disk. For instance, a clutch that engages at one place first, as was indicated by the blue (from overheating) marks on the clutch in the example I described, will have an unbalanced load acting this way on the hub. Same if there was axial misalignment as in the first diagram. Take a long look at the 6-sp diagram to the left and then take a look at the pictures of the damaged input shafts. 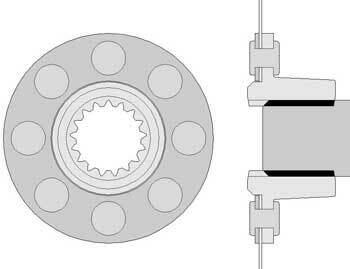 Think about what kind of motion (between hub and shaft) is necessary in order to wear away the material at the very inside of the splines but not along the length of them. Stripped splines on the disk, worn splines at the base of the shaft but not in the middle. The paint hasn't even worn off the friction surface yet! 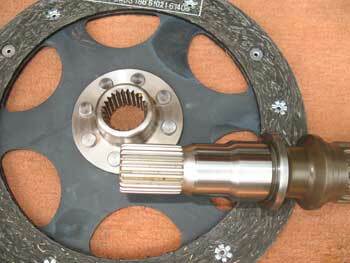 Partial engagement can be seen by the spline remnants deeper in the clutch hub. This is from a six-speed. 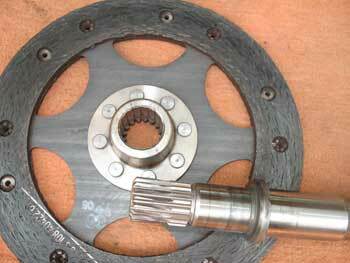 Also consider that the K1200RS/GT/LT (using the exact same input shaft) very rarely experience spline failure. Not only do they have a machined clutch housing rather than a stamped one as on the boxers, the input shaft engages the clutch hub like on the 5-speed boxers. I don't know why BMW used different spline engagement for the two model lines, but I suspect it has to do with the development history. The 6-speed was first used on the K1200RS, and then (with external changes only) used on the boxers. However, whereas the K1200 was an all-new design in 1998, the R1150-type boxers had an established chassis geometry dating from 1993, specifically the distance from the crankshaft to the swingarm pivot which is effectively the working length that the clutch and transmission must occupy*. With the same internal shafts as the K12 model but with possibly different working room, the designers may have chosen to make up extra space with additional length on the transmission side of the clutch hub. Let me start by saying this is not a widespread epidemic. A relatively small number of bikes is affected, and mostly from a range of two years or so, but it's a high profile failure. I personally would not let this be a cloud hanging over my own decision to buy an 1150. As for the failure itself, I don't think the offset spline engagement is the cause of the failures, but I think it enables the cause (whatever that might be, misalignment of some sort) to rapidly destroy the spline interface whereas it might do so much more slowly on a shaft design such as the 5-speed pictured above. If you experience this sort of failure, I suggest you make every effort to measure crankshaft-transmission alignment and clutch housing runout. If you don't have the means or inclination to do so, replace everything from the clutch housing to the input shaft (housing, spring, pressure plate, friction disk, clutch cover, shaft) to eliminate any misaligned or unevenly worn parts. With the expense involved in removing the clutch and replacing the transmission input shaft, you really don't want to reuse any suspect components. * With all of the models under discussion, the axis of the swingarm coincides with the center of the forward u-joint on the driveshaft. Since this clips onto the back of the output shaft, the distance from the output shaft to the swingarm pivot is predetermined. 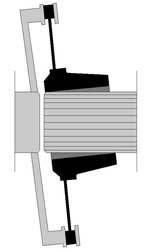 With the same internal transmission geometry, the position of the clutch splines is therefore also predetermined relative to the swingarm pivot. And because all boxers share the same forward transmission housing and the same engine case geometry, the distance to the crankshaft is the same.